It is a common mistake to regard National Socialism as a mere revolt against reason, an irrational movement without intellectual background. If that were so, the movement would be much less dangerous than it is. But nothing could be further from the truth or more misleading. The doctrines of National Socialism are the culmination of a long evolution of thought, a process in which thinkers have had great influence far beyond the confines of Germany have taken part. Whatever one may think of the premises from which they started, it cannot be denied that the men who produced the new doctrines were powerful writers who left the impress of their ideas on the whole of European thought. Their system was developed with ruthless consistency. Once one accepts the premises from which it starts, there is no escape from its logic. It is simply collectivism freed from all traces of an individualist tradition which might hamper its realization. Though in this development German thinkers have taken the lead, they were by no means alone. Thomas Carlyle and Houston Stewart Chamberlain, Auguste Comte and Georges Sorel, are as much a part of that continuous development as any Germans. The development of this strand of thought within Germany has been well traced recently by R. D. Butler in his study of The Roots of National Socialism. But, although its persistence there through a hundred and fifty years in almost unchanged and ever recurring form, which emerges from that study, is rather frightening, it is easy to exaggerate the importance these ideas had in Germany before 1914. They were only one strand of thought among a people then perhaps more varied in its views than any other. And they were on the whole represented by a small minority and held in as great contempt by the majority of' Germans as they were in other countries. 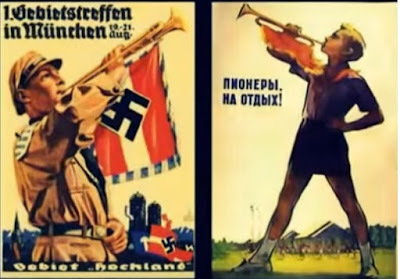 What, then, caused these views held by a reactionary minority finally to gain the support of' the great majority of Germans and practically the whole of Germany's youth? It was not merely the defeat, the suffering, and the wave of nationalism which led to their success. Still less was the cause, as so many people wish to believe, a capitalist reaction against the advance of socialism. On the contrary, the support which brought these ideas to power came precisely from the socialist camp. It was certainly not through the bourgeoisie, but rather through the absence of a strong bourgeoisie, that they were helped to power. 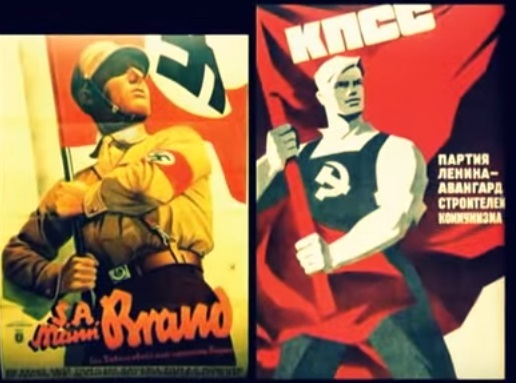 The doctrines which had guided the ruling elements in Germany for the past generation were opposed not to the socialism in Marxism but to the liberal elements contained in it, its internationalism and its democracy. And as it became increasingly clear that it was just these elements which formed obstacles to the realization of socialism, the socialists of the Left approached more and more to those of the Right. It was the union of the anticapitalist forces of the Right and of the Left, the fusion of radical and conservative socialism, which drove out from Germany everything that was liberal. 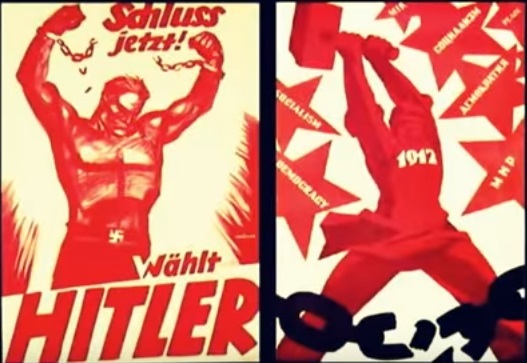 The connection between socialism and nationalism in Germany was close from the beginning. It is significant that the most important ancestors of National Socialism-Fichte, Robertus, and Lassalle-are at the same time acknowledged fathers of socialism. While theoretical socialism in its Marxist form was directing the German labor movement, the authoritarian and nationalist element receded for a time into the background. But not for long. 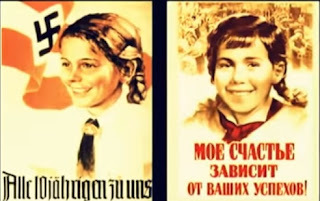 From 1914 onward there arose from the ranks of Marxist socialism one teacher after another who led, not the conservatives and reactionaries, but the hard-working laborer and idealistic youth into the National Socialist fold. It was only thereafter that the tide of nationalist socialism attained major importance and rapidly grew into the Hitlerian doctrine. The war hysteria of 1914, which, just because of the German defeat, was never fully cured, is the beginning of the modern development which produced National Socialism, and it was largely with the assistance of old socialists that it rose during this period. Perhaps the first, and in some ways the most characteristic, representative of this development is the late Professor Werner Sombart, whose notorious Handler und Helden (“Merchants.and Heroes") appeared in 1915. Sombart had begun as a Marxian socialist and, as late as 1909, could assert with pride that he had devoted the greater part of his life to fighting for the ideas of Karl Marx. He had done as much any man to spread socialist ideas and anticapitalist resentment of varying shades throughout Germany; and if German thought became penetrated with Marxian elements in a way that was true of no other country until the Russian revolution, this was in a large measure due to Sombart. At one time he was regarded as the outstanding representative of the persecuted socialist intelligentsia, unable, because of his radical views, to obtain a university chair. And even after the last war the influence, inside and outside Germany, of his work as a historian, which remained Marxist in approach after he had ceased to be a Marxist in politics, was most extensive and is particularly noticeable in the works of many of the English and American planners. In his war book this old socialist welcomed the "German War" as the inevitable conflict between the commercial civilization of England and the heroic culture of Germany. His contempt for the "commercial" views of the English people, who had lost all warlike instincts, is unlimited. Nothing is more contemptible in his eyes than the universal striving after the happiness of the individual; and what he describes as the leading maxim of English morals: be just "that it may be well with that it may be well with thee and that thou mayest prolong thy days upon the land" is to him "the most infamous maxim which has ever been pronounced by a commercial mind." The "German idea of the state," as formulated by Fichte, Lassalle, and Rodbertis, is that the state is neither founded nor formed by individuals, nor an aggregate of individuals, nor is its purpose to serve any interest of individuals. It is a Volksgemeinschaft in which the individual has no rights but only duties. Claims of the individual are always an outcome of the commercial spirit. "'The ideas of 1789"-liberty, equality, fraternity-are characteristically commercial ideas which have no other purpose but to secure certain advantages to individuals. Before 1914 all the true German ideals of a heroic life were in deadly danger before the continuous advance of English commercial ideals, English comfort, and English sport. The English people had not only themselves become compl etely corrupted, every trade-unionist being sunk in the morass of comfort," but they had begun to infect all other peoples. Only the war had helped the Germans to remember that they were really a people of' warriors, a people among whom all activities and particularly all economic activities were subordinated to military ends. Sombart knew that the Germans were held in contempt by other people because they regard war as sacred-but he glories in it. To regard war as inhuman and senseless is a product of commercial views. There is a life higher than the individual life, the life of the people and the life of the state, and it is the purpose of the individual to sacrifice himself for that higher life. War is to Sombart the consummation of the heroic view of life, and the war against England is the war against the opposite ideal, the commercial ideal of individual freedom and of English comfort, which in his eyes finds its most contemptible expression in the safety razors found in the English trenches. If Sombart's outburst was at the time too much even for most Germans, another German professor arrived at essentially the same ideas in a more moderate and more scholarly, but for that reason even more effective, form. Professor Johann Plenge was as great an authority on Marx as Sombert. His book on Marx und Hegel marks the beginning of the modern Hegel renaissance among Marxian scholars; and there can be no doubt about the genuinely socialist nature of the convictions with which he started. Among his numerous war publications the most important is a small but at the time widely discussed book with the significant title, 1789 and 1914: The Symbolic Years in the History of the Political Mind. It is devoted to the conflict between the "Ideas of 1789," the ideal of freedom, and the "Ideas of 1914," the ideal of organization. Organization is to him, as to all socialists who derive their socialism from a crude application of scientific ideals to the problems of society, the essence of socialism. It was, as he rightly emphasizes, the root of the socialist movement at its inception in early nineteenth-century France. Marx and Marxism have betrayed this basic idea of socialism by their fanatic but utopian adherence to the abstract idea of freedom. Only now was the idea of organization again coming into its own, elsewhere, as witnessed by the work of H. G Wells (by whose Future in America Professor Plenge was profoundly influenced, and whom he describes as one of the outstanding figures of modern socialism), but particularly in Germany, where it is best understood and most fully realized. The war between England and Germany is therefore really a conflict between two opposite principles. The "Economic World War" is the third great epoch of spiritual struggle in modern history. It is of equal importance with the Reformation and the bourgeois revolution of liberty. It is the struggle for the victory of the new forces born out of the advanced economic life of the nineteenth century: socialism and organization. "Because in the sphere of ideas Germany was the most convinced exponent of all socialist dreams, and in the sphere of reality she was the most powerful architect of the most highly organized economic system.-In us is the twentieth century. However the war may end, we are the exemplary people. Our ideas will determine the aims of the life of humanity.-World History experiences at present the colossal spectacle that with us a new great ideal of life penetrates to final victory, while at the same time in England one of the World-Historical principles finally collapses." The war economy created in Germany in 1914 "is the first realization of a socialist society and its spirit the first active, and not merely demanding, appearance of a socialist spirit. 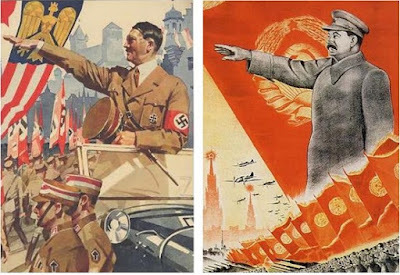 The needs of the war have established the socialist idea in German economic life, and thus the defense of our nation produced for humanity the idea of 1914, the idea of German organization, the people's community (Volksgemeinschaft) of 'national socialism.... Without our really noticing it the whole of our political life in state and industry has risen to a higher stage. State and economic life form a new unity... The feeling of economic responsibility which characterizes the work of the civil servant pervades all private activity." The new German corporative constitution of economic life, which Professor Plenge admits is not yet ripe or complete, "is the highest form of life of the state which has ever been known on earth." At first Professor Plenge still hoped to reconcile the ideal of liberty and the ideal of organization, although largely through the complete but voluntary submission of the individual to the whole. But these traces of liberal ideas soon disappear from his writings. By 1918 the union between socialism and ruthless power politics had become complete in his mind. Shortly before the end of the war he exhorted his compatriots in the socialist journal Die Glocke in the following manner: "It is high time to recognize the fact that socialism must be power policy, because it is to be organization. Socialism has to win power: it must never blindly destroy power. And the most important and critical question for socialism in the time of war of peoples is necessarily this: what people is preeminently summoned to power, because it is the exemplary leader in the organization of peoples?" 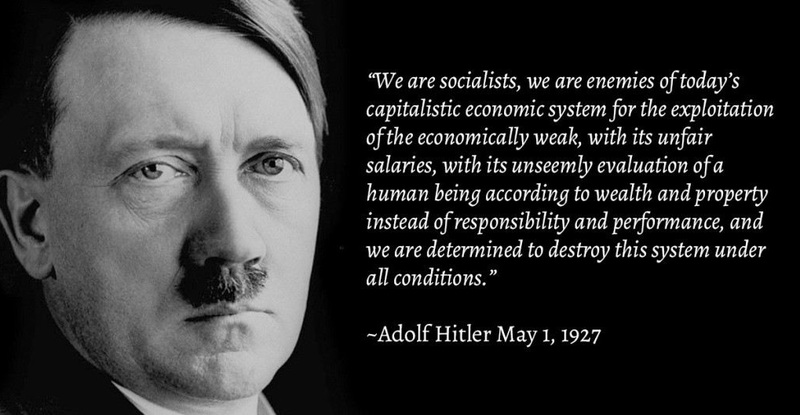 And he forecast all the ideas which were finally to justify Hitler's New Order: "Just from the point of view of socialism, which, is organization, is not an absolute right of self-determination of the peoples the right of individualistic economic anarchy? Are we willing to grant complete self-determination to the individual in economic life? Consistent socialism can accord to the people a right to incorporation only in accordance with the real distribution of forces historically determined." The ideals which Plenge expressed so clearly were especially popular among, and perhaps even derive from, certain circles of German scientists and engineers who, precisely as is now so loudly demanded by their English and American counterparts, clamored for the centrally planned organization of' all aspects of life. Leading among these was the famous chemist Wilhelm Ostwald, one of whose pronouncements on this point has achieved a certain celebrity. He is reported to have stated publicly that "Germany wants to organize Europe which up to now still lacks organization. I will explain to you now Germany's great secret: we, or perhaps the German race, have discovered the significance of organization. While the other nations still live under the regime of individualism, we have already achieved that of organization." Ideas very similar to these were current in the offices of the German raw-material dictator, Walter Rathenau, who, although he would have shuddered had he realized the consequences of his totalitarian economics, yet deserves a considerable place in any fuller history of the growth of Nazi ideas. Through his writings he has probably, more than any other man, determined the economic views of the generation which grew up in Germany during and immediately after the last war; and some of his closest collaborators were later to form the backbone of the staff of Goring's Five-Year Plan administration. Very similar also was much of the teaching of another former Marxist, Friedrich Naumann, whose Mitteleuropa reached probably the greatest circulation of any war book in Germany. But it was left to an active socialist politician, a member of the Left wing of the social-democratic party in the Reichstag, to develop these ideas most fully and to spread them far and wide. Paul Lensch had already in earlier books described the war as "the flight of the English bourgeoisie before the advance of socialism" and explained how different were the socialist ideal of freedom and the English conception. But only in his third and most successful war book, his Three Years of World Revolution, were his characteristic ideas, under the influence of Plenge, to achieve full development. Lensch bases his argument on an interesting and in many respects accurate historical account of how the adoption of protection by Bismarck had made possible in Germany a development toward that industrial concentration and cartelization which, from his Marxist standpoint, represented a higher state of industrial development. "The result of Bismarck's decision of the year 1879 was that Germany took on the role of the revolutionary; that is to say, of a state whose position in relation to the rest of the world is that of'a representative of a higher and more advanced economic system. Having realized this, we should perceive that in the present World Revolution Germany represents the revolutionary, and her greatest antagonist, England, the counter-revolutionary side. This fact proves how little the constitution of a country, whether it be liberal and republican or monarchic and autocratic, affects the question whether, from the point of view of historical development, that country is to be regarded as liberal or not. Or, to put it more plainly, our conceptions of Liberalism, Democracy, and so forth, are derived from the ideas of English Individualism, according to which a state with a weak government is a liberal state, and every restriction upon the freedom of the individual is conceived as the product of autocracy and militarism." In Germany, the "historically appointed representative" of this higher form of economic life, "the struggle for socialism has been extraordinarily simplified, since all the prerequisite conditions of Socialism had already become established there. And lietice it was necessarily a vital concern of any socialist party that Germany should triumphantly hold her own against her enemies, and thereby be able to fulfil her historic mission of revolutionizing the world. Hence the war of the Entente against Germany resembled the attempt of the lower bourgeoisie of the pre-capitalistic age to prevent the decline of their own class." That organization of capital, Lensch continues, "which began unconsciously before the war, and which during the war has been continued consciously, will be systematically continued after the war. Not through any desire for any arts of organization nor yet because socialism has been recognized as a higher principle of social development. The classes who are today the practical pioneers of socialism are, in theory, its avowed opponents, or, at any rate, were so up to a short time ago. Socialism is coming, and in fact has to some extent already arrived, since we can no longer live without it." The only people who still oppose this tendency are the liberals. "This class of people, who unconsciously reason from English standards, comprises the whole educated German bourgeoisie. Their political notions of 'freedom' and 'civic right,' of constitutionalism and parliamentarianism, are derived from that individualistic conception of the world, of which English Liberalism is a classical embodiment, and which was adopted, by the spokesmen of the German bourgeoisie in the fifties, sixties, and seventies of the nineteenth century. But these standards are old-fashioned and shattered, ,just as old fashioned English Liberalism has been shattered by this war. What has to be done now is to get rid of these inherited political ideas and to assist the growth of' a new conception of State and and Society. In this sphere also Socialism must present a conscious and determined opposition to individualism. In this connection it is an astonishing fact that, in the so-called 'reactionary' Germany, the working classes have won for themselves a much more solid and powerful position in the life of the state than is the case either in England or in France." Lensch follows this up with a consideration which again contains much truth and which deserves to be pondered: "Since the Social Democrats, by the aid of this (universal] Suffrage, occupied every post which they could obtain in the Reichstag, the State Parliament, the municipal councils, the courts for the settlement of trade disputes, the sick funds, and so forth, they penetrated very deeply into the organism of the state; but the price which they had to pay for this was that the state, in its turn, exercised a profound influence upon the working classes. To be sure, as the result of strenuous socialistic labors for fifty years, the state is no longer the same as it,was in the year 1867, when universal suffrage first came into operation; but then, Social Democracy, in its turn, is no longer the same as it was at the time. The state has undergone a process of' socialization, and Social Democracy has undergone a process of nationalization." Plenge and Lensch in turn have provided the leading ideas for the immediate masters of National Socialism, particularly Oswald Spengler and Arthur Moeller van den Bruck, to mention only the two best-known names. Opinions may differ in how far the former can be regarded as a socialist. But that in his tract on Prussianism and Socialism, which appeared in 1920, he merely gave expression to ideas widely held by German socialists will now be evident. A few specimens of his argument will suffice. "Old Prussian spirit and socialist conviction, which today hate each other with the hatred of brothers, are one and the same." The representatives of Western civilization in Germany, the German liberals, are "the invisible English army which after the battle of Jena, Napoleon left behind on German soil” To Spengler, men like Hardenberg and Humboldt and all the other liberal reformers were "English." But this "English" spirit will be turned out. by the German revolution which began in 1914. “The three last nations of' the Occident have aimed at three forms of existence, represented by famous watchwords: Freedom, Equality, Community. They appear in the political forms of liberal Parliamentarianism, social Democracy, and authoritarian socialism. ... The German, more correctly, Prussian, instinct is: the power belongs to the whole.... Everyone is given his place. One commands or obeys. This is, since the eighteenth century, authoritarian socialism, essentially illiberal and antidemocratic, in so far as English Liberalism and French Democracy are meant... There are in Germany many hated and ill-reputed contrasts, but liberalism alone is contemptible on German soil. "The structure of the English nation is based on the distinction between rich and poor, that of the Prussian on that between command and obedience. The meaning of class distinction is accordingly fundamentally different in the two countries." After pointing out the essential difference between the English competitive system and the Prussian system of "economic administration" and after showing (consciously following Lensch) how since Bismarck the deliberate organization of economic activity had progressively assumed more socialist forms, Spengler continues: "In Prussia there existed a real state in the most ambitious meaning of the word. There could be, strictly speaking, no private persons. Everybody who lived within the system that worked with the precision of a clockwork, was in some way a link in it. The conduct of public business could therefore not be in the hands of private people, as is supposed by Parliamentarianism. It was an Amt and the responsible politician was a civil servant, a servant of'the whole." The "Prussian ideal, requires that everybody should become a state official-that all wages and salaries be fixed by the state. The administration of all property, in particular, becomes a salaried function. The state of the future will be a Beamtenstaat. But "the decisive question not only for Germany, but for the world, which must be solved by Germany for the world is: Is in the future trade to govern the state, or the state to govern trade? In the face of this question Prussianism and Socialism are the same. . . . Prussianism and Socialism combat the England in our midst." It was only a step from this for the patron saint of National Socialism, Moeller van den Bruck, to proclaim World War I a war between liberalism and socialism: "We have lost the war against the West. Socialism has lost it against Liberalism. As with Spengler, liberalism is, therefore, the arch enemy. Moeller van den Bruck glories in the fact that "there are no liberals in Germany today; there are young revolutionaries: there are young conservatives. But who would be a liberal? ... Liberalism is a philosophy of life from which German youth now turns with nausea, with wrath, with quite peculiar scorn, for there is none more foreign, more repugnant, more opposed to its philosophy. German youth today recognizes the liberal as the archenemy." 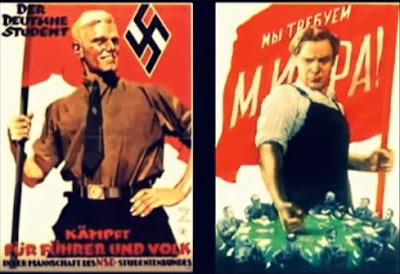 Moeller van den Bruck’s Third Reich was intended to give the Germans a socialism adapted to their nature and undefiled by Western liberal ideas. And so it did. These writers were by no means isolated phenomena. As early as 1922 a detached observer could speak of a "peculiar and, on a first glance, surprising phenomenon" then to be observed in Germany: "The fight against the capitalistic order, according to this view, is a continuation of the war against the Entente with the weapons of the spirit and of economic organization, the way which leads to practical socialism, a return of the German people to their best and noblest traditions. 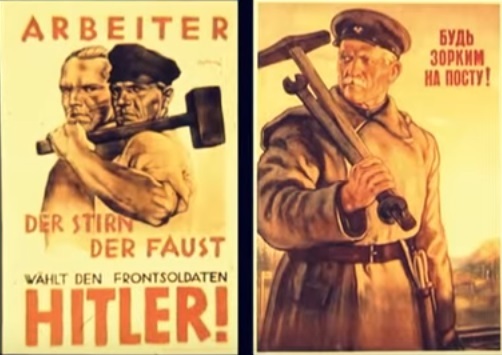 Fight against liberalism in all its forms, liberalism that had defeated Germany, was the common idea which united socialists and conservatives in one common front. At first it was mainly in the German Youth Movement, almost entirely socialist in inspiration and outlook, where these ideas were most readily accepted and the fusion of socialism and nationalism completed. In the later twenties and until the advent to power of Hitler a circle of young men gathered round the journal Die Tat and, led by Ferdinand Fried, became the chief exponent of this tradition in the intellectual sphere. Fried's Ende des Kapitalismus is perhaps the most characteristic product of this group of Edelnazis, as they were known in Germany, and is particularly disquieting because of its resemblance to so much of the literature which we see in England and the United States today, where we can watch the same drawing-together of the socialists of the Left and the Right and nearly the same contempt of all that is liberal in the old sense. 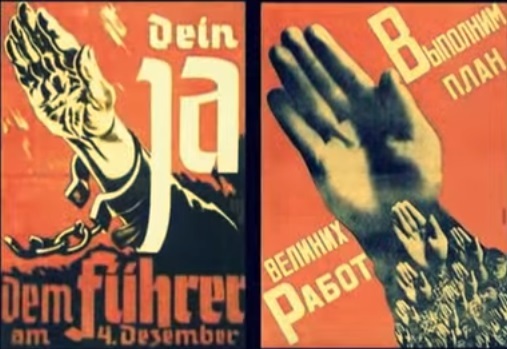 "Conservative Socialism" (and, in other circles, "Religious Socialism") was the slogan under which a large number of writers prepared the atmosphere in which "National Socialism" succeeded. it is "conservative socialism" which is the dominant trend among us now. Had the war against the Western powers "with the weapons and spirit of economic organization " not almost succeeded before the real war began? Οι Washington Times περί Σοσιαλισμού, Οικονομικής Ελευθερίας, Ελλάδας και Bernie Sanders. Αναρτήθηκε από Unknown στις 6:07:00 μ.μ.